Insert your Docomo 3G sim card in the sim-slot of N73 (this was the obvious one part). Head over to Menu> Tools> Settings> and scroll a little down to Network. Click on Network and you’ll see ‘Network Mode’ that is ‘Automatic’ by default. You have to click it and change it to ‘UMTS’. If you don’t do this, you are going to get GPRS speeds even when the sign (just below signal bars) shows 3G. Your phone will ask you for a restart and you need to allow it. Since you changed the networking mode, a restart is required. Now, head over to Menu> Tools> Settings> Connection (3rd one from top) and create a new access point by clicking ‘Access Points’. There might be several access points listed because once you insert your sim (even if it is Tata Docomo) the phone sends a message to operator and downloads the settings for internet connectivity (however, if you don’t save them, you will not see them in this section). By default, all of them access their internet properties via GPRS, this is why we need to create a new Access Point, to let it know that we want to connect through 3G and not GPRS. Click on Options (left button will do the trick) and New Access Point> Use Default Settings. You don’t have to worry about Default settings because you are going to change them in a minute anyway (if you choose Existing Settings, the phone will show you a scroll list (if there are more Access Points) and you don’t need it). As you select ‘Use Default Settings’, the next screen will lead you to edit your new Access Point (connection). Choose connection name as per your convenience, “Tata Docomo 3G” seems direct and appropriate connection name (to edit these options click on their name). Data Bearer must be Packet data by default and you don’t need to change it. Access Point Name > tatadocomo3g (without caps and without any spaces). you do not need to change any other options, so hit back and you should see your new connection by alphabetical order. 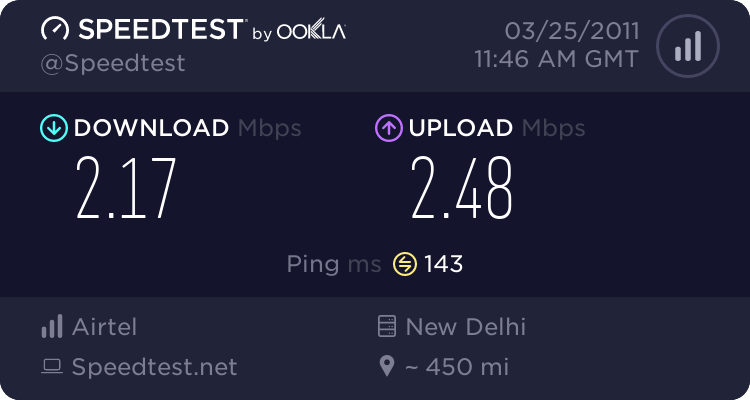 Using “A Tata Docomo 3G” will be more convenient as it will keep your new connection on top of other connections. Now, all you have to do is select this new network while you surf the web, via N73 browser or Opera Mini 5. So, this is it. Now if you are wondering how Nokia N73 works/performs on Tata Docomo 3G, then view the snapshot below and read my review by following the link.